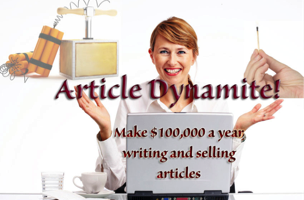 My new web writing package, "Article Dynamite: Make $100,000 a Year Writing and Selling Articles" gives you the information and skills you need to make GREAT money writing web articles. A brand new guide to writing articles FAST! Get inspired: yes, you can build a complete (very profitable) writing career and business, just on Web articles. Discover how you can make great money, just writing articles... FAST. "I wanted to let you know how well it's working for me. I put methods 3 and 7 into use immediately, turning a couple of existing articles from "overview => subset". Now, only an hour and a quarter after downloading it I've listed 69 article titles and written 4 new article drafts. It's been a great investment, thanks for another really useful guide!"